It's Blue Monday.. hosted by our gracious Sally over at http://smilingsally.blogspot.com/ where you'll find a full list of blue participants. I personally can't wait to see all the posts today full of their beautiful blues... After getting home and back in the "normal" routine around here, I've changed things up once again. 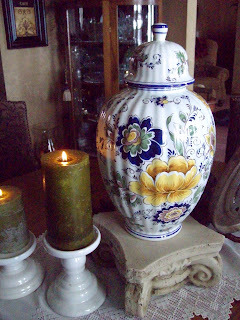 The Ginger Jar centerpiece is a gift Mr. P. gave me almost 30 years ago. Isn't it "gorgeous"? I love the deep cobalt blue and the golden yellow in the flowers. I moved the metal plate in from the living area. I thought the gold center stone went well with the yellow gold of the flower. We picked up the ginger jar from a floral shop that was closing out. I immediately fell in love with the colors. I can't remember what he paid for it, but trust me it was pretty dog gone cheap!! ..lol You see Mr. P. as generous as he is, doesn't really think all these do-nothing things are all that important..lol.. On the bottom it reads Ardalt Primavera Made in Italy 4421. I googled Ardalt Primavera and many things came up, so if you're interested you might google it as well. It's even pretty on the backside.. lol Isn't the cobalt blue absolutely "gorgeous"? I couldn't resist including the shot of the sun shining through the plate. Almost an angelic glow don't you agree ? Perched at the bottom of the concrete base are 2 of the cutest little squirrels sitting a top their acorn finds. This little guy seems to be hanging on to his find for dear life.. I had to move him out of the glow of the sun so you could see his darling face. With Easter around the corner and my love for bunnies, I decided to put the squirrels away for now. 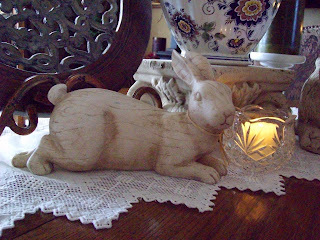 I pulled out the stone bunny and the darling wooden bunny to add to the decor. Okay, maybe this little guy is looking "almost" shy like. It's okay sweetie. All these nice ladies love bunnies too! I have thought of you and your hubby many times and prayed this week. I am so happy to hear this great news. I hope continued improvements are coming his way. What a gorgeous jar is right! LOVELY PIECE! I do love the shape and the beautiful colors. The plate is really neat too. I love that style and the yellow jewel center. Thanks for coming by tonight and your kind words. I'm still pinching myself on my win. You know it's always good to hear from you. Have a wonderful Blue Monday. 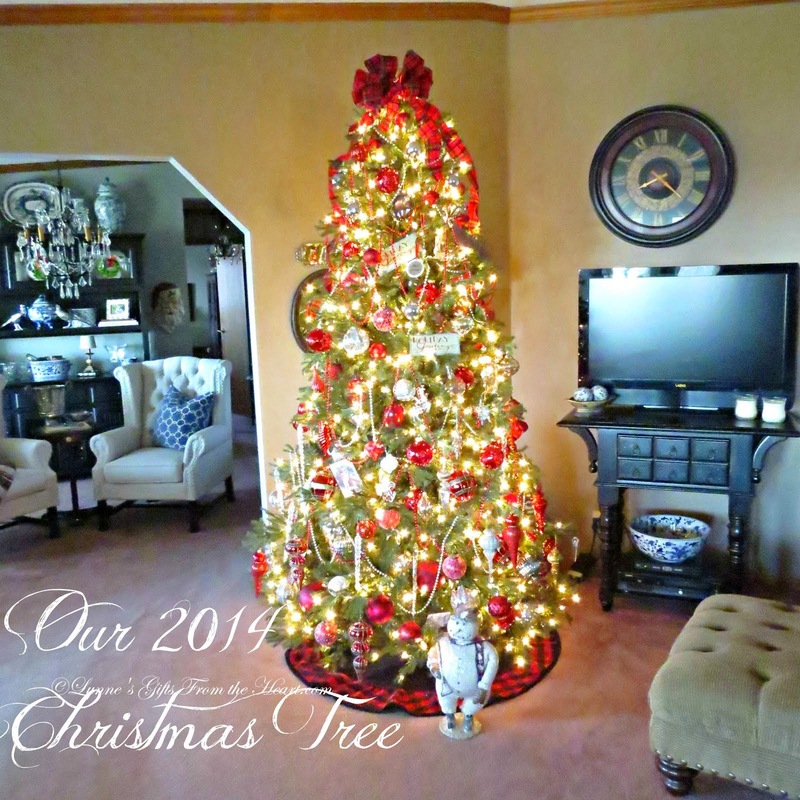 Love your vignette Lynne...the scale and movement is just superb! Glad to hear your husband is doing much better! 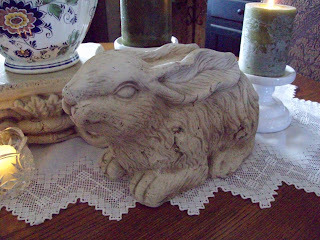 Love your vignettes and the bunnies!!!. Take care of yourself also - so important! Hi Lynne, so glad that Mr. P is doing well right now. That's good news! Love your vinettes with the squirrls and with the rabbits. Easter is just around the corner! When you mentioned Italy, I immediately recognized the style. I love how they use colors! You Hubby has great taste! Thank you so much for coming by earlier. Sooo glad to hear your hubby is doing better, and, you are getting back into the swing of things. Your ginger jar is wonderful!!! Yes, I do like it without the bunnies too. They take away from your lovely jar. Continued prayers for his continued improvement. Have a week filled with sunshine inside and out. Hi Lynne! Happy yo hear Mr P doing better...but what about you? You need to get some rest sometime!!!! 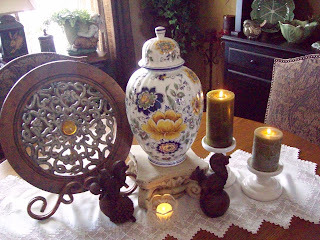 I love that ginger jar....you are right..the yellow/blue is beautiful...and oh my the bunnies...can never ever have too many! Thanks for visiting my blog. I have enjoyed reading yours as well and joined up as a follower. Sorry to hear about your husband, but glad that he is doing better. I pray that he will continue to improve! It is snowing here tonight!! Love & blessings from NC! 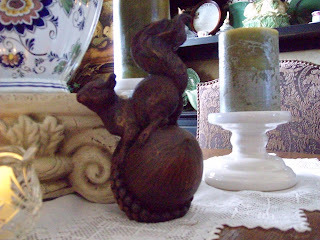 Pretty jar... love the squirrel with the nut! Lynne, I'm so happy to hear hubby is doing better! I agree, the cobalt blue is so gorgeous. Your bunnies are adorable too. Gets me in the Easter mood! Lovely post. that's a pretty piece of jar. I'm happy to hear that your husband seems to be over the hump. 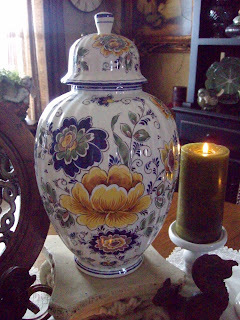 Yes, I have always loved cobalt blue, and combined with yellow just seems to make that ginger jar top notch! Your vignette is perfect. Thanks for sharing. Happy Blue Monday. 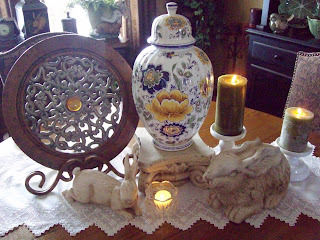 Your vignette is so lovely, I really enjoyed seeing it and the pretty ginger jar as well. I'm so glad your Mr. P is doing well~ that is cartwheel worthy!! 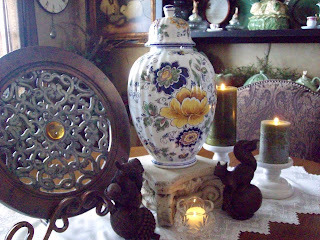 Lovely display, that jar is FAB and the squirrel~ just priceless. Your jar is beautiful! And I love bunnies! They are so cute! If you just put a zero behind today's date, we can pretend that today is the first day of spring. I am so ready for Winter to say bye, bye for this year. Glad your DH is improving. I think about the two of you quite often, and you both remain in my prayers. You lovely jar puts me in mind of Spring also, not just how close it really is to the beginning of the season. The blue reminds of blue skies and the yellow makes me think of the daffodils that I have blooming right now. What a beautiful jar. I love the blue and yellow together. So glad your hubby is doing better. Lynne,So glad Mr. P is feeling better! 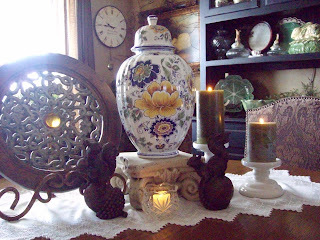 Love your ginger jar vignette! That looks to be a very treasured piece! Happy Blue Monday! Oh Lynne, if that just isn't the best news ever...to hear that Bill is having better days...I just believe that the Lord has heard and answered our prayers!!! Well my friend, I'm so glad to see you "up and runnin'" again...sure did miss all of your posts while you were taking care of your honey! What a beautiful vignette...I love the ginger jar, it's absolutely beautiful and love the pretty decorative plate you are displaying with it! 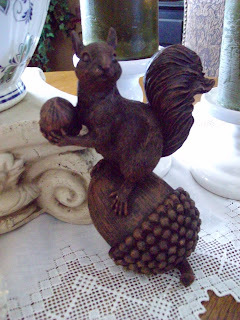 Your little squirrels and acorns are just precious...you just have the cutest things! I love your bunnies too! I think you're "wearin' off on me", Girl...I found two of the cutest little bunnies at the thrift shop a couple weeks ago...I'll have to do a post on them! Hehe! Just sharing in your thankfulness for Bill feeling better and so happy to see you back!!! Praise God that Mr. P. is doing better. I'm so sorry for your scare. I'll pray that he'll receive the right medication and that his body will adjust well to it. 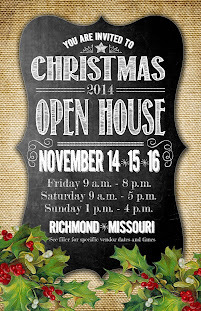 I really enjoyed seeing your jar and your little critters. So cute!! Thank God that Mr. P is doing better. It must be so scary to go through something like that. I love the Ginger jar. It is so special and the colors are favorites of mine. Take care of yourself while taking care of hubby. Good news about your hubby, Lynne!!! J had to have a coumadin adjustment last fall. He had to keep notes on dosages there for awhile, just to keep it all straight. He tests once a month. He went back to the routine dosages last month and had his protime last Friday morning. We'll see what happens next! People are always amazed he has anything wrong with him, because he is so healthy looking!! I love your blue Monday post and those squirrels are fabulous!! Pretty jar. You have a gift for arranging. Glad to hear Mr. P is doing so well,and that things are getting back to normal for you, what a wonderful word normal. 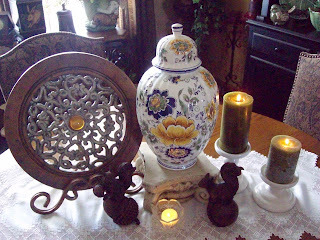 Beautiful ginger jar and I love animal the figurines., especially the bunny. Thank you for sharing. Oh, Dear Lynne! I'm so glad your hubby is better and we'll continue to pray for good results on his next visit. Oh, I love your vase - it's beautiful. There's just something about blue and yellow that is so soothing. Now those little squirrels were precious, but the bunnies! Oh, tell them I think they're adorable! I'm so glad things are going well for Mr. P! 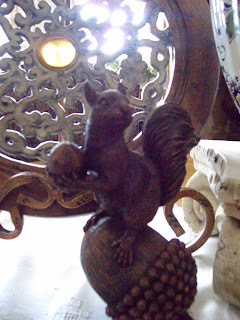 That ginger jar is gorgeous, and the little squirrels are so adorable! Thank you for visiting my Southern Lagniappe blog and for taking the time to leave a note for me. I think your ginger jar is absolutely exquisite. The cobalt and gold are so beautiful together. I enjoyed your pretty blog and will be back to visit again soon. I'm so glad to hear your hubby is doing better. There were a bunch of the ladies keeping us up to date by email. I've had you both in my prayers. That metal plate is gorgeous...wow how would it be to have so many pretty things that you can actually put some of them away! Lynne, I'm so glad Mr. P is doing well!!! I've had you both in my thoughts and prayers gf! Hello and Happy Blue Monday. Lovely blue ginger jar. What a treasure. Your vignetees are so pretty! Thank you so much for stopping by and leaving such a sweet comment. Prayers to Mr. P, I'm so glad that he is doing better! It just pleases me so much that your husband is doing so much better. Prayers are a wonderful thing, aren't they? Lynne, you have the prettiest accessories in your home. Yes, that ginger jar is fabulous. How fun you got it for such a good deal. I was loving' that squirrel and now I'm lovin' the bunnies! Such sweet little faces on all of those shy critters. P.S. Thanks for your kind comments about my faux arrangement! Lovely items and I love that ginger jar. Happy Blue Monday! I am so glad your hubby is doing better! So happy for you and him! I love the jar and the stand its sitting on! The squirrel is darling! I had a great afternoon. My grands got picked up early. Remember I have a few awards for you, when you get a moment! Take care. hi lynne, i wanted to stop by and say hi and see how Mr P was doing, i pray that continues to be on the mend. Morning girl...so glad to hear hubby is doing better. Love your beautiful treasures..that jar is glorious and those little squirrels were adorable...I have been looking for some bunnies for Easter that were rustic looking but so far all I can find are the 'pretty' ones! lol lol Have a great week sweetie! Glad your hubby is on the mend!! 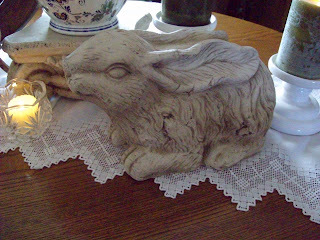 Love your vignette - the bunnies are too cute - I've seen several the last couple of weeks and thought of you. Oh you sweet little toot...you made me cry....the fact that you even remembered I had that teaset from last year....yes I have it out...it is one of my favorite pieces and I am planning on going to Hobby Lobby and TJ MAXX this week..you are such a sweetheart! Three good days for Mr. P.....that's good news. Will continue prayers for him. The ginger jar is gorgeous!! My favorite colors .... my kitchen decorations are cobalt blue and yellow. I think of them as happy colors. Your blog and your sweetness are such a blessing. Your bunnies, the ginger jar, everything is so..it feels like home. Always so warm and inviting. I am delighted that Mr.P is doing so well. Our worlds are not right when anything is wrong with them! I no longer take anything for granted. I never will again. My love and best wishes to you. What beautiful blue and gold!! I love it!! Oh...the bunnies are so cute!! You both remain in my prayers sweet lady...I am so glad that Mr.P is doing better now. Bless you both. I love your pretty vignette! 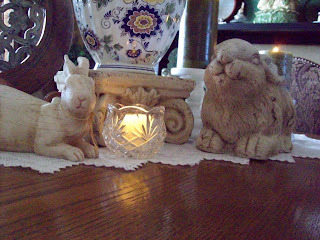 Love your ginger jar and bunnies...the "sun" shot was awesome! Lovely vignette. The ginger jar is gorgeous and I love those adorable bunnies!